2. Descriptive Linguistic Studies of Classical Period (including phonology, morphology, syntax, syntax-semantics-pragmatics interface of the successive classical periods). 5. Grammatical Treatise of Kannada which constitute a part of technical texts (sastra granthas) of Kannada. 6. Lexicography of Classical period (both study of the traditional lexicographic works and developing modern lexicographic resources for the language of Classical Period, text specific dictionaries). 7. Glottochronology and Etymological Studies. 8. Graphology and evolution of Kannada script system. 1. Karnataka Epigraphy (inscriptional studies - stone inscriptions. 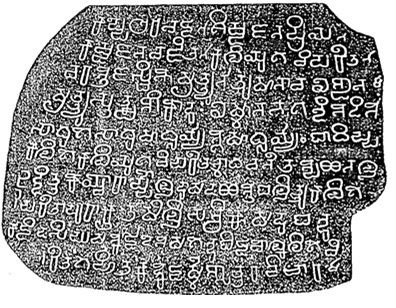 metal and non-metal inscriptions, veeragallu (hero stones), nisadigallu (nisadi stones) and mastigallu etc. 3. Documentation and Digitalisation of Handwritten texts (manuscripts of a text, administrative correspondences, letter correspondence of important personalities or institutions (like private and religious institutions, asrams, mathas, temples. Basadis etc., which are a significant record of Kannada language pertaining to the classical period, which are not available yet for academic persuasion). 4. Unfocused texts, palm leaf manuscripts or handwritten material, of which the dating and relevance are yet to be studied. 1. Classical texts and inscriptions as sources for political History of Karnataka and India. 3. Historiography of Kannada literature.